To be eligible for treatment of orthodontics through the NHS you must be refereed to the practice by your general dentist. You must also be under the age of 18 to have treatment free of charge. There is a scale and ratio designed by the NHS that determines whether the patient case is severe enough to be covered through the NHS. Orthodontic treatment isn’t just beneficial for teenagers and adults – it’s important for children too. That’s because, the earlier your child sees an orthodontist, the earlier any potential orthodontic problems can be identified. It is recommended that your child has their first orthodontic consultation between the age of seven and 11 while their teeth and jaws are still developing. If you would like your child to be treated at Malmin Orthodontics under the NHS please ask your dentist to refer your child to us. Thank you so much for straightening my teeth. I am so happy with them! We can only treat a certain number of children each year so there may be a waiting list. We may not be able to provide treatment if you do not reside in the Primary Care Trust area. All minor and aesthetic problems can be treated that are not covered by the NHS. Will I be covered under the NHS? IOTN stands for Index of Orthodontic Treatment Need. It is a ranking assigned to each patient to determine the necessity for orthodontic treatment and is used to assess eligibility for NHS treatment. If you do not meet the NHS IOTN criteria, it is still possible to have orthodontic treatment. We offer low-cost fees for under 18’s on fixed metal or ceramic braces. Or alternatively you can receive treatment as a private patient and choose from our range of discreet and virtually invisible options. Yes, there are several differences between NHS and private treatment. Under the NHS, the choices of brace type and appointment times are very limited. With private treatment, there is a wide range of brace type available, appointment times are flexible and include after-school appointments. Can I have white brackets under the NHS? 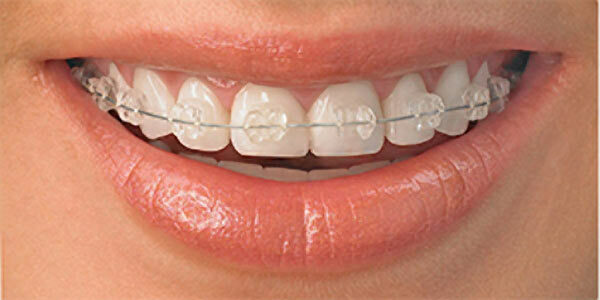 Metal braces are the only braces available under the NHS. Tooth- coloured options are available on our private and low-cost schemes. How much does private or low-cost treatment cost? Low-cost treatment starts from £995. Private treatment starts from £1995. We offer interest-free payment plans and are happy to discuss payment options with you. Many people have crowded or crooked teeth or jaws that are out of alignment (malocclusion – meaning “bad bite”) and orthodontic treatment can straighten the teeth or move them into a better position. This not only improves their appearance but also the way the teeth bite together. The placement of bands and brackets on your teeth does not hurt. Once your braces are placed and connected with the arch wires, you may feel some soreness of your teeth for one to four days. Your lips and cheeks may need one to two weeks to get used to the braces on your teeth. Can I choose the colours on my braces? Yes! You are able to choose the colours of the ‘modules’ which you might have seen on your friends’ braces. There is a wide range of colours to choose from. It depends on whether you are a private patient, a low-cost private patient, or an NHS patient. Private patients can choose from a range of different options, while our low-cost patients have a choice of two types. Under the NHS however, you are only able to have fixed metal braces. Some foods that we eat are harmful to fixed braces and are likely to cause breakages. Toffees, boiled sweets, mints and hard crusty bread etc. will force the brace away from the teeth or damage/distort the wires. They will also stick and cause decay leaving permanent marks or cavities. Hard fruits or vegetables such as apples or raw carrots can be eaten but must be cut into bite sized pieces first. If you have overcrowding, you may need to have some small teeth removed in order to create enough space for the rest of your teeth to be moved into a perfect arch. However, the orthodontist will always recommend removing teeth as a last resort. At the end of your treatment, you will be left with a lovely smile and no-one will ever know you had teeth out. It is essential to maintain excellent oral hygiene when you are wearing braces. You may find that it is a little more difficult to brush and floss, but we will give you instructions on how to brush with your braces. Elastics are small elastic bands that some patients need to wear to correct the position of the jaw. Not everyone needs elastics, but they are easy to wear. It is unlikely that your braces will break if you are following the instructions of the orthodontist. However, if something does break, we will book you in to have it fixed, although sometimes it is fine to wait until your next fixed adjustment appointment to have it repaired. Retainers are essential as they help to keep your teeth straight when your braces are taken off. Teeth move all through life, and wearing retainers can limit the movement, keeping your teeth straight. Retainers can be fixed (a thin wire glued to the back of your teeth) or removable (clear plastic trays that fit over your teeth and are almost invisible).